Jacob Abraham, the creative talent that is Heavenly Events and Catering, is a perfectionist. At each of his catered events this valuable attribute is clearly evident in every single detail from start to finish. He's not merely an event planner; he's a creator of the unusual, the extraordinary and the sublime. He makes dreams come true, bringing his clients visions to reality. 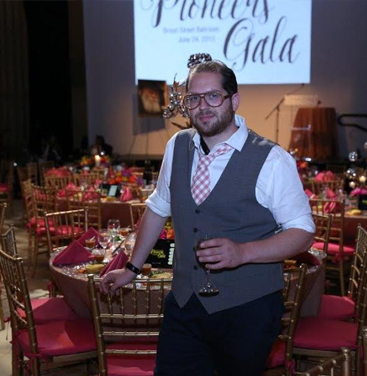 Jacob and his Heavenly Event's team have been making intimate family parties, weddings, bar and bat mitzvah celebrations, engagement parties and corporate events divine for almost 10 years. Our experience is evident in every aspect of your catered event. Jacob is obsessive about the food presentation. Not only is it extremely appealing to the eye, each delectable bite is an explosion of mouthwatering flavors on your palate. Jacob also loves a challenge. No theme is too difficult, no color combination is too strange and no dream is too big. You give him the event and budget and he will do his best with out-of-the-box thinking to bring your vision to life. Even if you don't have any specific ideas, Jacob will help inspire you with an array of different themes, pictures, samples and innovative concepts. Simply contact us and let’s get your party started! Heavenly Events and Catering is supervised by the most trusted label in the industry: the Orthodox Union Organization, located in New York City. This certification, which is recognized worldwide by the observant Jewish community, means that we uphold the highest Kosher standards. "HEAVENLY EVENTS – A TASTE OF HEAVEN ON EARTH"